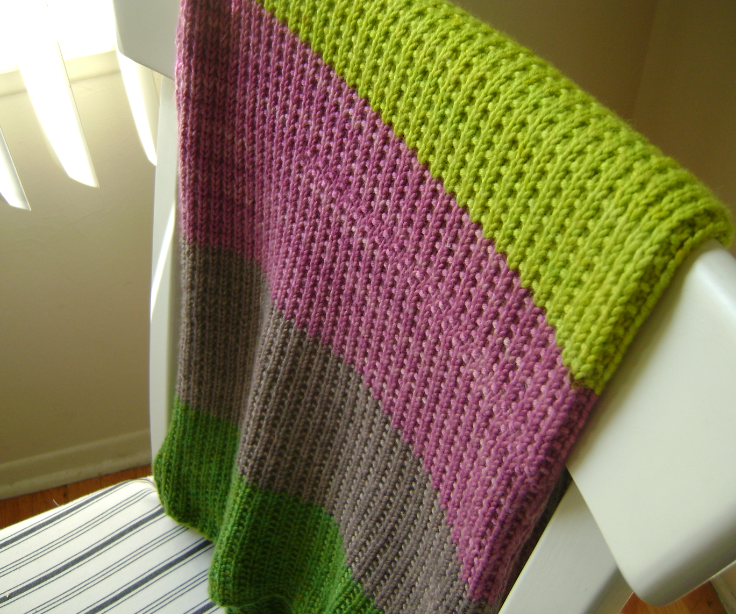 Despite the rising temperature outside, I really enjoyed knitting this baby blanket inspired by Purl Bee’s Super Easy Baby Blanket. The original blanket is knit entirely in garter stitch but since I’m not a big fan of the stitch (I really don’t like the way it looks), I changed it up a bit. I’m not sure what the proper name of the stitch is called but I Knit 1 and Purl 1 all the way across the first row, knit all the way across the second row, and repeated these two stiches until I finished seven skeins. I knit this on and off at night, about half skein a night, and took me about three weeks to complete it. The pattern is very simple with on real counting involved, so it’s perfect while watching a DVD or listening to the radio. I went outside my color box and selected a hue combination that I usually don’t pick. Knowing that this was going to be a gift for a baby girl, I wanted something bright and fun, without being overly girly. I alternated the green / gray / pink combination twice. I used Green Plum, Fieldstone, Ruby, Sour Grass, Silver, Hush, and Tea Leaf (not pictured), in that order. 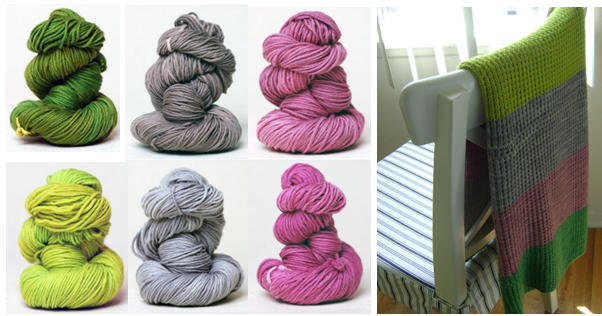 You can always rely on the expert eyes of Purl Soho and Alchemy staffs, and use their color ideas. The Alchemy Temple 100% superfine marino yarns that I purchased at Purl Soho were great to knit with. I wasn’t sure about the texture at first, but after I hand washed it and let it air dry, the softness came to life. 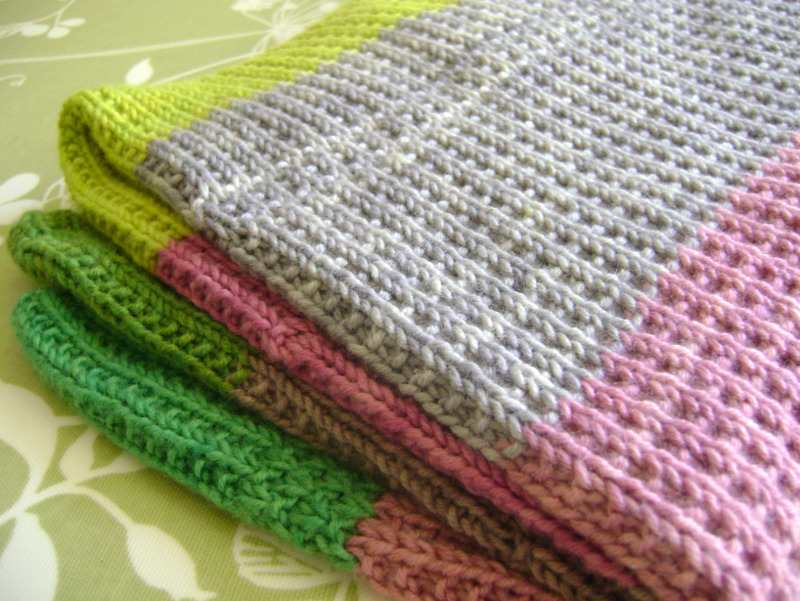 The blanket is so soft and feels amazing on a skin – perfect for a baby. I think the garter stich will give a softer and cozier feel, but I really like how mine came out too. Just make sure to wash the blanket before gifting since the color runs like crazy. I ended up washing it in a sink like 10 times with all-natural detergent, and added few tablespoons of vinegar several times while rinsing to set the color. Handmade Playmat for Baby K! Here is the playmat I made for my boyfriend’s baby niece, who turned one this weekend! YAY! I was determined to make a handmade gift for her so I was happy when I came across this wonderful tutorial from my favorite craft blog, The Purl Bee for inspiration (this blog is created by my favorite crafter, Joelle Hoverson, who is also the co-owner of the lovely Purl Soho). Perhaps the most challenging part about this sewing project was matching the two fabrics (I usually end up spending hours trying to find the best combination and get a major headache) but other than that, it was a fun and tear-free project to make, and I absolutely love the way it turned out. All fabrics are from Heather Baily’s Nicely Jane line that I purchased online. I absolutely adore her style! It feels like it was only yesterday that Baby K came into this world, and at age one, she is as cute as ever! Happy birthday, sweet little angel! P.S. Please meet Yonda, my panda friend, who made her blog debut here today.